Janaki Kumar, former Vice President and Design Evangelist, office of the Chief Design Officer at SAP Labs. She is also on the faculty at Stanford, where she teaches customer experience from neuroscience perspective. Recent advances in AI, ML and robotics have many wondering: Will there be no work left for humans to do? As long as we need to deal with climate change, protect wildlife and fragile ecology, feed the world, end disease, resettle refugees, and educate the next generation, there clearly is plenty of work for us all. The more important question is: Are organizations responsible for delivering returns to their shareholders regardless of social, environmental, and human consequences? The good news is that a new type of organization is emerging, one that delivers not just financial returns but serves the greater good of society they operate in. There are predictions that AI and automation will take over our jobs. Elon Musk has shared the view that there is a good chance that we will end up with universal basic income due to AI, and people will ave time to do other, more interesting things. This could ultimately lead to having more leisure time. But there is still so much work to be done. The real question is – What is the relationship between work and employment? And what is the role of business in society? Today, the goal of business is to increase profits; this has guided our thinking for many years. It is apparent in our language – we are either for profit or not-for-profit, public versus private. But this is starting to change. Larry Fink is the CEO BlackRock, an investment firm that manages six trillion dollars of investments. He believes society is demanding more of companies – they have to deliver financial performance, but they are increasingly expected to deliver a positive contribution to society as well. This implies that there are big changes ahead in the enterprise. When the role of business changes, the mission and the metrics by which we measure the success of business will also need to change. How will the company contribute to society? Human tasks will become more complex, multi-dimensional. Things there are simple and can be automated, will be automated. Thus, the skills that an enterprise worker has will fundamentally change. We have to hone our skills to match the complexity of the task at hand. When this future arrives, Enterprise UX designers will have an amazing opportunity! We have four super powers that will enable us to be the heroes of this future. Janaki shared how she used here her work experience in a completely different context. While on vacation in India, she met a childhood friend, Dr. Vinu Aram, who has a PhD in public health and works for an NGO. 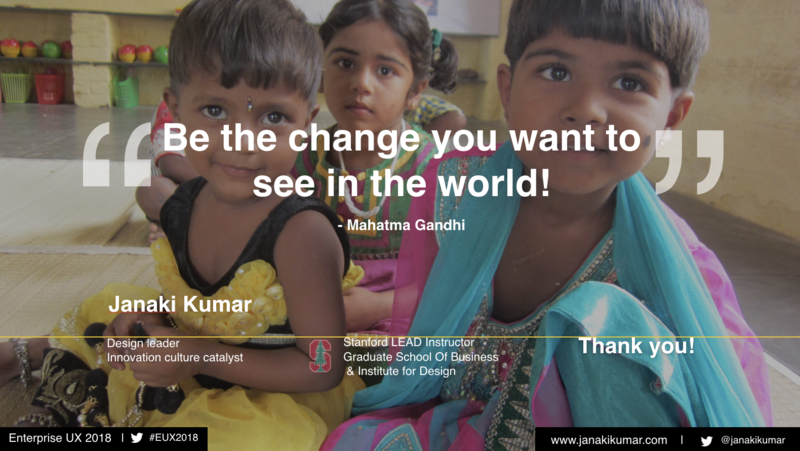 Dr. Aram asked for help in applying design thinking to the NGO during Janaki’s two weeks of vacation. Janaki observed schools, women-led businesses, and other aspects of the NGO, and then she organized a workshop. 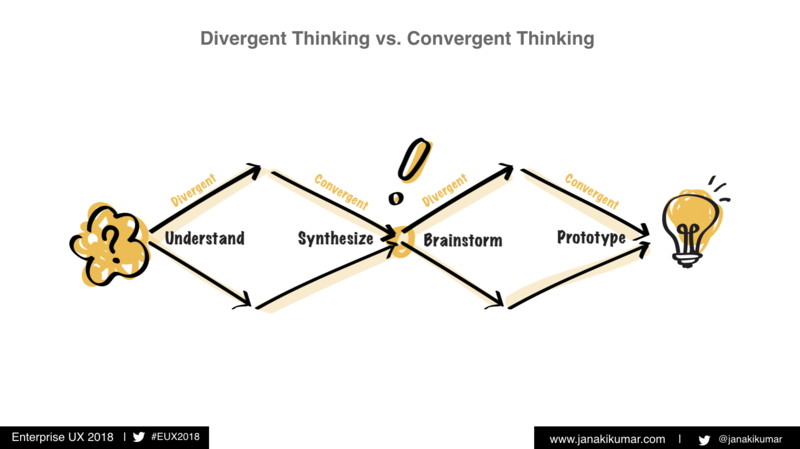 She invited a cross-functional team (including business leaders, stakeholders, and end-users, and she taught them the basics of DT, focusing on divergent and convergent thinking. The workshop was a tremendous success – they generated ideas that energized both the NGO and the broader community. They found funding to build a community health center. Janaki was particularly struck by the easy transferability of our work in Enterprise UX to social impact problems. 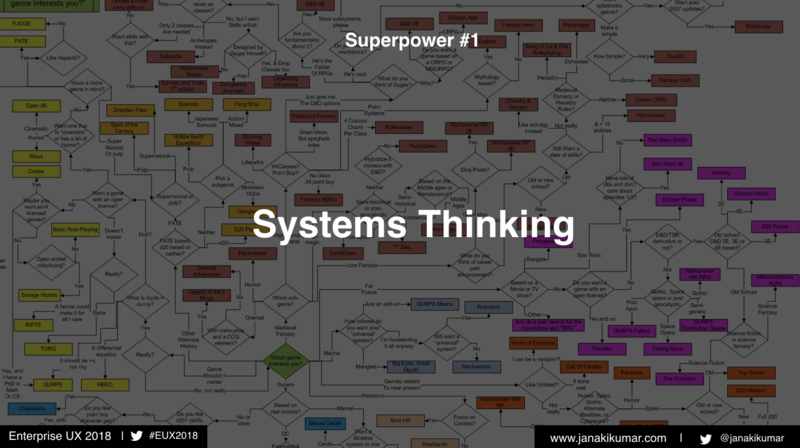 We are trained to think about the interconnectedness of systems. We think about data creators and data consumers, requesters and approvers, supply and demand, access rights and value chain. These things are invisible, but they need to be considered in order too create sustainable systems. It is the same in designing for social impact. When designing for vulnerable populations, you have to think about sustainability. You need that to build trust and create sustainable success. 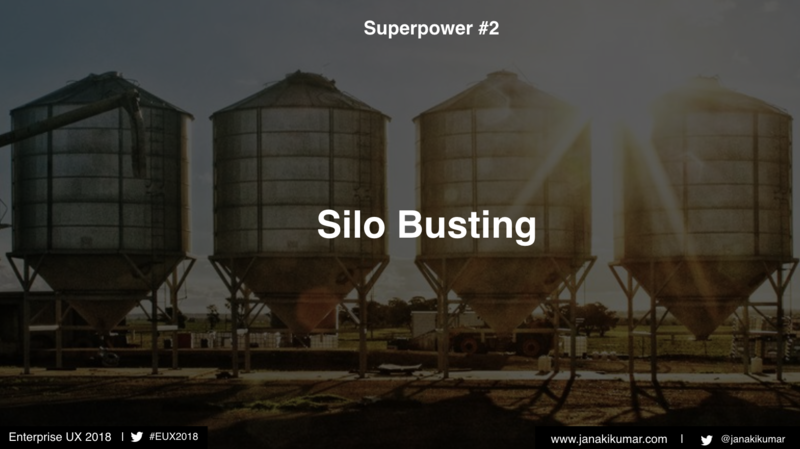 As Enterprise designers we encounter silos frequently; they are inevitable in large organizations. They can stand in the way of our effectiveness, but we don’t let that stop us; we find ways to get the work done anyways. We do what it takes. Silos exist in small organizations as well. 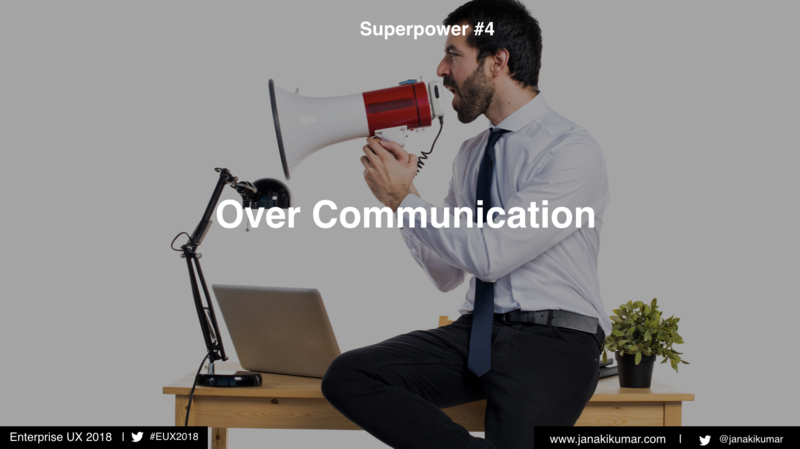 In her workshop, by giving the groups permission to eavesdrop on each other, they created a different, more collaborative dynamic in the workshop. We are relentless in fighting for them. Products are paid for by IT and management. Thus, purchasing decisions are made based on features, not on experience. We have to make the case for experience and ease of use, and we have to articulate experiences in ways that resonate for buyers. The same is true for a successful NGO. They need to secure funding from philanthropic organizations. Janaki had the audience divide into pairs. Person A thinks of their favorite song, in their head. No singing or humming – just clap the song. They hear the song in their head, but Person B doesn’t hear the song. One pair at EUX was able to guess, but that is very unusual! The point is that when you are really passionate about a topic, you hear the song in your head. Everyone else just hears the clapping. You have to be ready, be patient with the listener until your message gets heard. So important in social impact. Many NGOs de-prioritize communication, because they believe the work should speak for itself. But the reality is the the message must be communicated over and over in order for people to understand the value of the work being done. When the robots do take over, what can be automated? Our work will be strategic, multi-faceted, creative, and complex. The changing role of business beyond profits to focus on people and planet means that it’s a great opportunity for Enterprise Designers to shine. 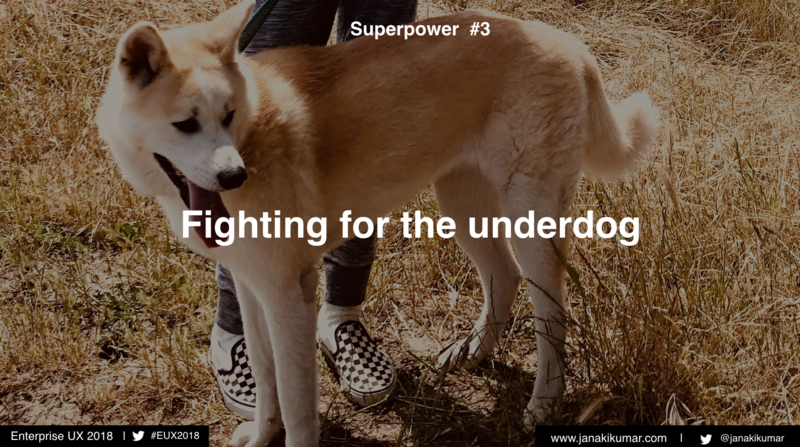 Our superpowers have been developed through years of hard work in the enterprise, so Janaki is confident we’ll be the superheros of the future.